Official pictures: Mazda 3 saloon | What Car? This is the Mazda 3 saloon, which was unveiled today at the Los Angeles Motor Show. The car is in American specification, but gives strong clues as to how the Mazda 3 hatchback will look when it is revealed at the Bologna Motor Show in December. Mazda says the new car is more refined, quieter and has a sportier ride than its predecessor, as well as highlighting that it achieves top-class fuel economy, which will be boosted by the introduction of more efficient engines and a Stop-Start system. The styling adopts the Mazda family face seen on recent models such as the Mazda 2, and contributes to the car's low aerodynamic drag, making it more fuel efficient. Inside, the reworked dash has been reworked and the seats are longer to provide better support. There are more soft-touch materials. 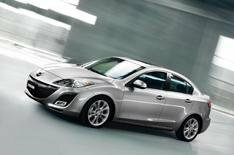 The new Mazda 3 hatchback and saloon will go on sale in the UK next April.